Spending time outside is a great way to bond with friends and family. Outdoor patio furniture is a popular addition to backyard spaces from gardens to decks and patios. But if you are lucky enough to have a swimming pool, you may be looking for water safe specific accessories. One great accessory that will enhance the look of your pool and help keep you pool when you are not splashing in the water is a pool umbrella. Pool umbrellas are specifically designed to be safe for use around or in water. This means that they are a great addition to any pool space and offer cooling comfort, as well as enhance the beauty and style of your pool area. However, there are tons of styles on the market and lots of features that you should consider before making a purchase. When searching for a top rated swimming pool umbrella, you will want to consider features like the size, type, material, durability, and budget. These features can help determine what makes a quality design. The best pool umbrella will be made of high-quality materials to be long-lasting and durable. It is also important to find one that suits your personal preference and style. With all the designs, you should be able to find the best swimming pool umbrella that is reliable, functional, and something you love to display. If you need to hide from the sun, this umbrella will block 98% of the sun’s harmful UV rays. It has a telescoping tripod base, which adjusts from 3 feet to 8 feet tall. The canopy is 60 inches in diameter and has gust flaps to ensure the wind can pass through. It is easy to carry and portable. It can be quickly set up and taken down. A tilt features enhances the coverage. Nighttime pool party? No problem, we’ve got you covered. 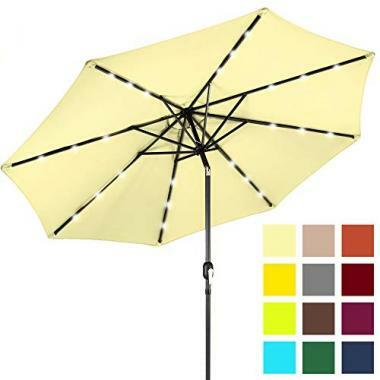 This amazing umbrella by Best Choice Products has LED lights can run for 6-7 hours on one charge and are turned on with a switch that is located on the pole. This makes this umbrella perfect for use any time of the day or night. 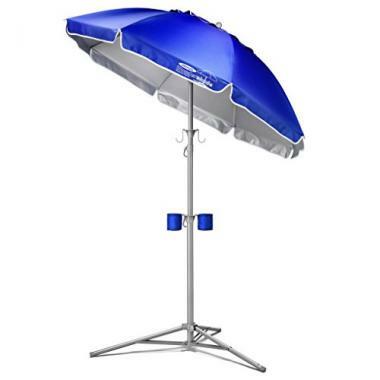 The canopy of the umbrella, which supports the lights, is made of a high-durability fabric. The fabric is UV, water, and fade resistant. You can adjust your shade with the easy to use push-button tilt. This system ensures that at any time of the day or in any wind condition, you stay protected and cool under the canopy. It has a convenient crank handle for an easy open and close system. With minimal effort, you can expand the canopy in just seconds. It has a quick and hassle-free setup. There is a storage and a detachable pole. If you would like a base, it can be purchased separately. Best Choice Products ensures that whether you are relaxing under the sun or moon, you will have protection. If you need a large canopy, this 9-foot diameter that will shade a round, square, or rectangle table with a diameter 42-54 inches. It is ideal for both residential and commercial use. It is made of 100% post-consumer recycled polyester fabric. The canopy is fade resistant, water repellant, and UV protected. It is solution dyed for a minimum of 1000 hours of UV colorfastness. The pole is made of aluminum that is rust-free and powder coated. The pole has a 1.5-inch diameter. It has steel ribs to support the canopy in any weather condition. The aluminum pole has superior strength to be durable. It has a crank mechanism for an easy open and close system. It also features a push-button tilt to move the canopy into various positions. The canopy is vented for airflow and a round shape. 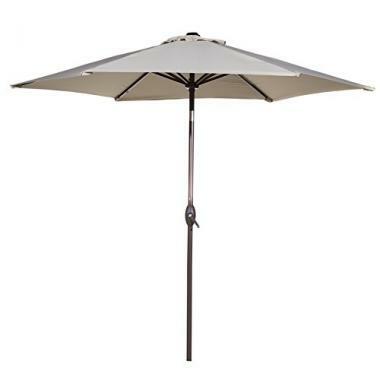 The Patio Umbrella is a large size that has a 7 ½ foot diameter. It can shade an area of 24-46 inches. It works for square and rectangular tables and 2-4 chairs. It is ideal for residential and commercial locations. The canopy is made of 100% polyester fabric. The fabric is waterproof and has 98% UV protection. It is vented for air flow and to prevent accidental inversion. The high-quality material will last for many years. It has a crank handle for easy opening and closing operation. The canopy can be tilted using a push-button to maximize the shade as the sun’s position changes throughout the day. The pole is made of aluminum and it has steel ribs. All the metal is rust-free and powder coated for superior strength to resist the wind. The design can change from an in water pool umbrella to be like in ground pool umbrellas using a base. The base is not included but can be purchased separately. With Blissun’s design, you can enjoy the sweet time with your family and friends. If you need a fully adjustable umbrella that is UV rated and safe, Shade Science has you covered. It has a canopy of 5 feet 7 inches to provide all the shade you need. It has an adjustable pole that expands up to 78 inches and is rust-proof. This design is unique because it can float in the water or be secured to a table top. The material is safe to use in salt water, chlorinated pools, lakes, and rivers. It is safe for the wind and perfect for the beach. You can also use the 5 cup holders as a counter weight to ensure it never tips over. 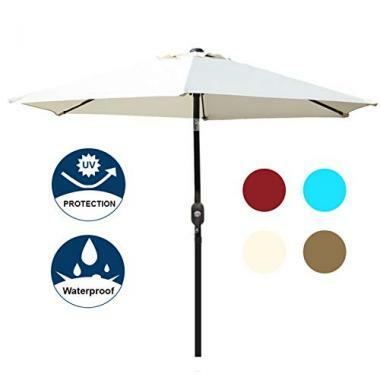 With a 10-foot canopy that is designed to keep you cool and comfortable in your outdoor space, this umbrella is a great pick. It has a durable composition. The pole is made of aluminum that is powder-coated. It is also resistant to rust and scratching, as well as water, UV, and fading. It can be easily adjusted with a hand crank lift and features an easy tilt system. A dual-purpose wind vent ensures cool air is let in and the canopy will not invert in windy conditions. It can be easily paired with a base, which is sold separately. 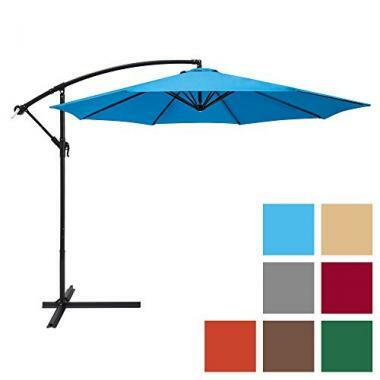 For those who are sensitive to the sun and need maximum protection, but still want to enjoy a day at the pool the Offset Cantilever Umbrella by Abba Patio is the best option. It also has 98% UV protection. The canopy can be easily cleaned. 8 steel ribs support the canopy. All the metal is powder coated and resistant to chipping, peeling, rust, and corrosion. The 11-foot diameter means that it can shade dining tables up to 72 inches and fit 6-8 chairs. The canopy can be easily positioned around the table with a crank lift system. It has 5 different positions with the vertical tilt function. A cross base is included with the purchase, but weights are not. You can purchase weight separately, which is suggested for windy conditions. Swimming pools are a great place to cool down in the summer heat. Lots of people use accessories like pool noodles and pool floats to relax in the water, but sometimes it’s fun to relax by the water too. When you don’t want to be in the water swimming or just want to dip your toes, portable pool umbrellas provide excellent protection from the sun. Often, people may mistake poolside umbrellas with patio umbrellas. While they are very similar and often look the same, there are a few features of pool umbrellas that make them stand out. The best swimming pool umbrella can be used both inside and outside of the pool water. An in water pool umbrella is a popular choice because you can submerge the base into the water. If your pool has shallow platforms or a shallow relaxing area, you can easily set up your umbrella while you dip your toes. A top rated swimming pool umbrella will have a design that is anti-corrosive and waterproof to ensure they can be constantly used in pool water. It can be difficult determining which umbrella for pool designs would be best for you. Not all poolside umbrellas are built the same or of high-quality materials. 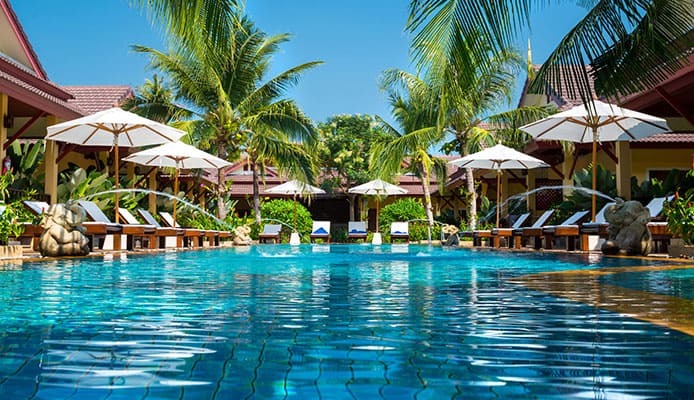 Our guide will give you all the information you need to make the best choice and find the best swimming pool umbrella. However, you should also consider pool umbrella reviews to find out what other people think about a specific brand or design. The size of an umbrella is determined by the measurement of the canopy. Poolside umbrellas come in a lot of different sizes, so you shouldn’t struggle to find a design that suits your needs. Rather, the size of your umbrella will be determined by the factors of the space you intend to use your pool patio umbrella and your budget. As we stated, portable pool umbrellas come in a variety of sizes. Whether you have a small or large space, you should be able to find a design that fits. To help you envision what size pool umbrella you need, this mini guide will give you estimates of the size of the umbrella and the area of shade it provides. 5-6 foot canopy: This size is ideal for four people. It can fit 30-inch tables and up to 4 chairs. 7 foot canopy: This size is can fit a larger table that is about 36 inches. It can easily accommodate up to 4 chairs. 5-8.5 foot canopy: This size can fit tables that are 36-40 inches and can provide shade for up to 6 chairs. 9-10 foot canopy: This size will protect larger tables with a size of about 40-48 inches. It can accommodate up to 8 chairs. 11-13 foot canopy: This is one of the largest canopy sizes for a single umbrella. It can fit tables up to 48 inches and accommodate about 10 chairs. It is important that you spend the time to find the correct size of poolside umbrellas that you need. An umbrella that is too small won’t provide enough shade for the space you want, but an umbrella too large can be overwhelming or not fit into your space. The best way to determine what size you need; you should take measurements of the space and correlate them to the canopy size of an umbrella. Taking measurements beforehand can save you time, money, and frustration. Rather than buy the incorrect umbrella, you can find the best swimming pool umbrella on the first try. Umbrellas are a straightforward design. They have a canopy with a supporting shaft. However, not all umbrellas for pools are the same type. There are two types of umbrellas that are the most commonly seen on the market. The first is market patio and the second is offset patio. Market patio umbrellas: These are the most common type of umbrella. They are the signature image of an outdoor umbrella. They have a straight pole that is rested on a base. They can be easily used with patio tables or in the middle of two patio chairs. Offset patio umbrellas: These umbrellas are becoming popular because they are less intrusive than market patio umbrellas. This type of umbrella has a pole on the side instead of the middle. The canopy then hangs offset from the pole. 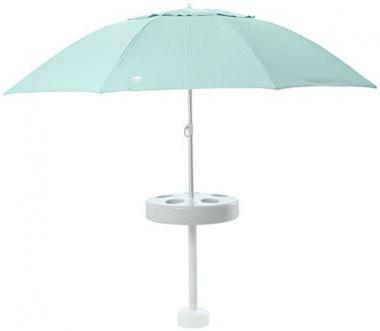 It can be the perfect umbrella for using with lounge chairs because instead of having to maneuver around the pole, the center space is free from interference. There may be a few other types of umbrellas, but they will be less common designs. Depending on what you want, market and offset patio umbrellas are two excellent designs for you to choose from. It is important that an umbrella for pool designs is made of quality and durable materials. The best materials that a top rated swimming pool umbrella can be made of are metal and a heavy-duty fabric that is natural or synthetic. Aluminum is the most common type of metal used for the pole of a pool patio umbrella. Aluminum is a strong metal that is still lightweight. It is resistant to rust and corrosion, as well as safe for use in water and chemical treated water. It is a great material that is durable and reliable. A durable canopy may be made of a natural or synthetic material. Canvas is a natural material that is a popular choice for it’s durability and aesthetic. If you choose canvas, you will want to be certain that it has been treated to be water resistant or waterproof. Synthetic materials used like polyester are also excellent because they are lightweight, durable, and waterproof. If you want quality materials, you should consider looking at top brands. Well-known brands are most likely going to use the best quality materials to make the best pool umbrella. It may help to look at pool umbrella reviews to determine if the materials used are up to high-quality standards. Durability is extremely important for a top rated swimming pool umbrella because they are designed to be used outside and exposed to various elements. A durable poolside umbrella will be resistant to damage from rain, sun, and wind. This means that if you leave your umbrella outside and it rains, it won’t be damaged. You will likely be using it in the sun and therefore it shouldn’t fade. If a gust of wind knocks it over or rattles it, your umbrella should still remain damage free. You can ensure you have found a durable umbrella for pools if it is made with quality materials. The best materials will be strong components in their own right and when combined all together, they will make for a durable poolside umbrella. Just like size, it is important that you spend the time to find a durable pool patio umbrella. It can be a headache to invest in a pool umbrella, only to have it break upon setup or the first use. As well, the best pool umbrella that is durable will last you throughout the years of repeated and continual use. Poolside umbrellas may not be the most expensive accessory, but they are still an investment. There are a lot of different prices that you will find for pool umbrellas. Some designs are affordable, and others may be more expensive. The large range in prices can make it tricky to make a decision. People often don’t want to purchase cheap products but are also interested in saving money. 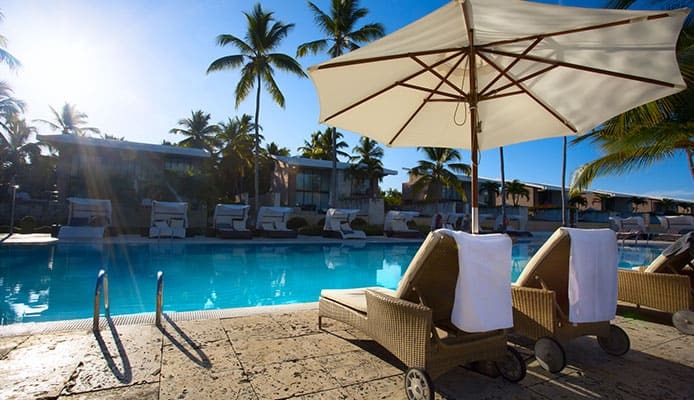 There are poolside umbrellas with prices from about $35 to $200 dollars. The majority of designs are affordable at around $50 dollars. For poolside umbrellas, the range in prices doesn’t always mean a range in quality. You can reference pool umbrella reviews, but many designs that are affordable are still high-quality designs. The most inexpensive designs will be the market patio umbrellas because they are the most simple and common. The straight shaft means there aren’t any fancy parts, and everything can be made with quality materials, but still be sold inexpensively. Offset umbrellas are a little more complicated in their design and are often slightly more expensive. However, keep in mind that the price of even the best pool umbrellas will also be affected by the size of the canopy. The larger the umbrella canopy is, the more expensive it will be. If you are looking to provide protection to a large space, adjust your budget accordingly. But you shouldn’t ever struggle to find an umbrella in your budget. Everyone with any type of budget can purchase a top rated swimming pool umbrella. Q: How should I take care of my umbrella? A: Even the best pool umbrella needs to be taken care of. It is important that you learn how to take care of your umbrella to ensure that it stays in it’s best shape and lasts for a long time. The care of your umbrella will ultimately be dependent on the specific umbrella design that you have chosen, and the materials used. The best way to care for your portable pool umbrella is to follow the brand or manufacturer’s instructions. A guide or instructions should be included with your purchase that will be specific to the design and materials. Following these instructions is the best way to ensure you’re your umbrella won’t be damaged if you try to clean it. In general, you should be able to spot clean your umbrella using water and a mild soap. You can apply this mixture to the canopy using a soft sponge. It shouldn’t damage the fabric and will easily dry. The pole of the umbrella can be wiped down using water, but you shouldn’t have to clean often. If you want to just rinse off dirt, a hose can also work. Another way to take care of your umbrella is to store it correctly when it is not being used. This will ensure that you don’t have to constantly clean your umbrella and it will always look its best. Q: How should I store my umbrella when not in use? A: One of the best ways to care for your poolside umbrella is to properly store it when it is not in use. This means that every time you aren’t actively using your umbrella, you take it down and put it away. The canopy should be easily collapsed and secured with a band. 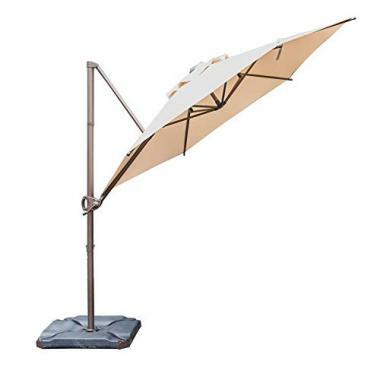 You can then move the umbrella out of the sun, rain, or wind. The best place to store a portable pool umbrella is in a cool, dark, and dry place. The storage area should be covered and clean. It is also extremely important that your pool patio umbrella is completely dry before being collapsed and stored. A damp umbrella that is stored is at risk for developing mold, mildew, and rot, which will damage and destroy your umbrella. Mold, mildew, and rot can cause the canopy to develop holes or fail to be resistant to the elements. It is also bad for the moving parts of the umbrella, like the crank to open the canopy because it can make them difficult to maneuver. The better you care for your poolside umbrella, the better it will look and the longer it will last. Pool patio umbrellas can be used to enhance your poolside area, but they will need to constantly look new. By following these maintenance and care instructions, your umbrella will always make your pool shine. It can be complicated to make a choice, but it shouldn’t be. There are a lot of top rated swimming pool umbrellas to choose from, so anyone should be able to find one design that suits their needs. The best pool umbrella will not only enhance the look of your pool area, but it will also provide cooling and comforting shade. They can be used with tables, chairs, and loungers. 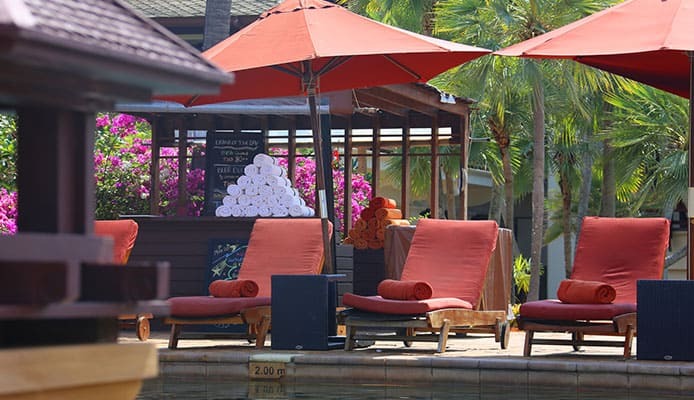 Anyone can enjoy sitting at the poolside under the shade with portable pool umbrella. Our guide aims to help you find the best swimming pool umbrella for your needs. You shouldn’t have to feel lost in all of the models and designs. With the best pool umbrella you can get back to relaxing by your pool. If you know exactly what you want or need, you can save time and money by investing in a top rated swimming pool umbrella that will provide shade all summer long. Do you own one of the pool umbrellas that made it onto our list? Let us know how it has worked for your poolside needs in the comments section below.